When people think cancer, people think dismay, debilitation, or even death. For Mr Chan, cancer was a word, not a sentence. From the moment the surgeon uttered that six-lettered word in confirmation of his illness, Mr Chan knew that while the journey was going to be difficult, it was a journey he was willing to endure. On a sultry Thursday afternoon, we visited him to relive that very journey. It was no more than an unsuspecting coincidence – an innocent advertisement inside Holland Village MRT, stating that colon cancer was very common amongst Singaporeans and that if diagnosed early, there is a cure. But something prompted Mr Chan to seek a check-up. “I just told my doctor that I am 57 and that at 50, many of my friends have gone for big check-ups while I have not,” Mr Chan remarked. Despite his doctor’s initial reluctance to give him a check-up, deeming it as unnecessary, Mr Chan pressed for it anyway. “In some senses, I was saved by the advertisement!” he laughed. If not for that advertisement, the cancerous tumour within his body could well have caused a lot more damage than it did. Things zoomed by in intervals of three – 3 days after his stool test, he was called up for a check-up and endoscopy, where his surgeon broke the news to him that he had cancer. 3 days following that, he had a general scan and another 3 days later, he was advised to seek surgery to remove the diseased portion of his colon. Despite the rapid course of events, Mr Chan said that in contrast to other worrying events in his life, he had remained “terribly calm”. In fact, he continued his work in the office even during the weekend before his major operation on Monday, attending the Raffles Parent’s Association (RPA) elections in the morning and the Old Rafflesian Association (ORA) elections following that in the afternoon. No one sensed that anything was amiss. Mr Chan decided to entrust his life to the medical professionals treating him. Mr Chan’s operation went by smoothly; yet, this was only the beginning. Unfortunately, doctors detected that one of Mr Chan’s lymph nodes showed traces of cancer cells, showing that the cancer might have spread beyond his colon. This meant going through chemotherapy. For Mr Chan, the side effect was numbness of the hands – until now, he still struggles with this condition. Recuperation was never going to be easy for him either. Yet, his friends and loved ones made it so much easier through their invaluable support. Mr Chan’s family members knew how to respond by treading the thin line between overreaction and underreaction. As he explained, “They know what kind of person I am: if I am in trouble and little concern is shown, it is natural to be affected; at the same time, overreacting might also be more of a bother.” His family ensured that he ate well and slept well, even fussing over whether Mr Chan could eat chicken rice with the skin on. Out of the blue, Mr Chan’s friends from his teenage years, people whom he had not kept in regular contact with for over 40 years, appeared in a blast from the past. 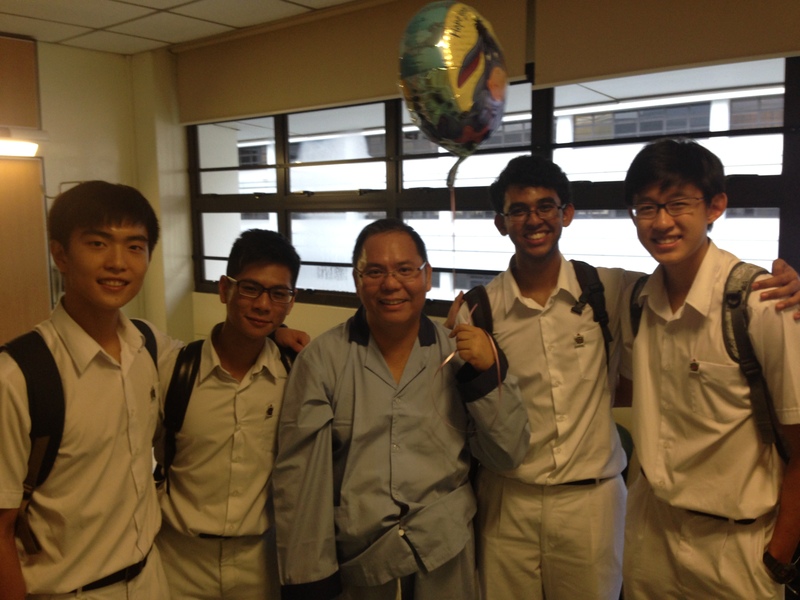 A smile lit up Mr Chan’s face as he brought us through how every Tuesday and Thursday, two sets of friends from his RI days would keep him company. On Tuesday, the friends would “chit-chat and talk about anything under the sun” and on Thursday, his friends would bring him to “all the various places where [he] could walk”. Ironically, when asked about whether he misses his recuperation, Mr Chan acknowledged with a laugh that while the “answer should obviously be ‘No!’”, he does “miss his Tuesday and Thursdays”. Mr Chan’s family and friends played the role of caregivers, a role that is frequently overlooked and under-appreciated. Behind every success story in battling cancer, caregivers stand watchful and silent, ready to step in when needed to render assistance. While doctors and patients undoubtedly take much of the credit, family members and friends are the unsung heroes of Mr Chan’s recovery process. Depending on others is a particularly important change which Mr Chan has experienced as a result of cancer, for it made him realise that he cannot rely on himself all of the time. “In the past, I thought that I was in control, and that I didn’t need any help from others,” he explained. Yet, everything boils down to having a balance too. “The funny part is that during the entire recovery, I would not have survived if I had relied on others; but neither would I have survived if I had relied on myself alone,” he said. Through this experience, he has learnt to be more grateful for his friends and for the support he got, while also realising that ultimately, the strength to recover could only come from within. However, the fight against cancer has hardly ended. To Mr Chan, the most difficult period in battling cancer is now – the remission period, with the threat of cancer returning hanging over him. It was through this brush with death that Mr Chan realised the need to realign his perspectives. Eminently aware of his own mortality, he decided that some changes had to be made to his life to minimize the capricious behaviour of the cancer cells in his body, especially since the key contributors to colon cancer are excessive stress and an unhealthy diet. With a self-deprecating laugh, Mr Chan gestured to his ample girth and admitted, “As you can see, I haven’t been very disciplined with my diet.” Steeling himself though, he added that he aims to pay more attention to his diet and engage in regular exercise. The thing that worries Mr Chan the most, however, is stress. As a self-described “happy-go-lucky” man, Mr Chan finds it difficult to identify signs of stress in his life. “The thing is, before cancer struck me, I thought that I had managed the stress – I thought that I was coping well with it,” he said. With doctors being “unable to provide all the answers”, Mr Chan’s future, at least in this respect, continues to be beset by uncertainty. 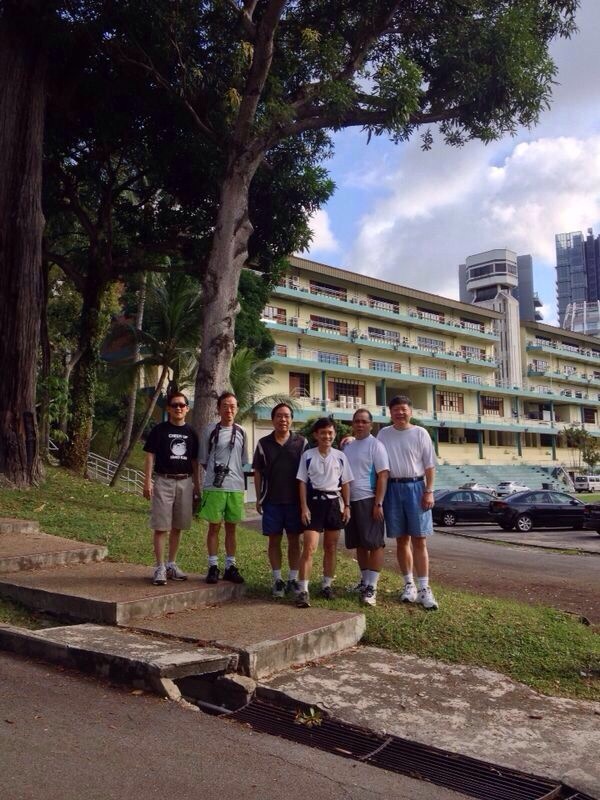 While work commitments are important to him, Mr Chan wants to ensure that his work does not compromise on his health. “It will be good if I can stay on for the long term – that way, I can serve RI best!” Mr Chan wisely opined. As he sagely shared, “We must balance finding meaning and finding health…my word now is ‘wholesome’.” For him, cancer came as a much-needed reminder to find time not just for work, but also for himself. One such example is in his decision to start swimming in the RI pool on a regular basis. “I will schedule these, it’s a priority,” he said, no matter how busy he is or how awkward it may seem for a school principal to be spotted taking a dip in the swimming pool in nothing but trunks. Keeping healthy is crucial for Mr Chan – working himself to death cannot be an option both for the sake of Mr Chan himself and the school. Mr Chan quickly added that cancer has, however, not changed any policies or plans he has in mind for the school. The changes he set out to make at the start of the year before he found out he had cancer are changes which he continues to pursue. For the future, Mr Chan said he just wants to come back to an ordinary schedule again and return to his duties. “I want to come back not just to work, but also to meaning,” he elaborated. “Like a lost child returning, having gotten lost in March.” Cancer might have changed much, but the one thing that remains the same is that when Mr Chan steps through the gates of RI, he is home again.